Step inside a mangrove forest and chances are your feet will disappear as you sink into gloopy mud; best advice is to keep moving. As coastal trees that thrive in saltwater, mangroves seem inseparable from mud. But a new study warns that some of these coastal forests are not muddy enough. Far inland, dams stymie the flow of sediment downstream—a dearth of dirt that could mean that, as the sea level rises, many mangroves may soon disappear beneath the waves. Around the world, millions of people rely on mangroves. The trees support rich fisheries, provide timber and wood for fuel, and help protect shorelines from erosion. But mangroves face many threats; the biggest, globally, is mangrove clearance for shrimp farms and other coastal developments. But now, for the first time, researchers have shown that the future of mangroves may also depend on the flow of mud. When left to run freely, rivers sweep muddy water toward the coast. Mangroves’ tangled roots trap the suspended sediment, adding it to the soil. So, when a dam curtails a river and cuts off the sediment, it chokes the forest of a replenishing supply of dirt. A research team led by Cath Lovelock from the University of Queensland, Australia, combined high and low-tech methods to show the effect of dams on mangrove forests. From satellite images, Lovelock and her team measured the color and muddiness of coastal waters around the Indian and Pacific Oceans. The researchers also got well and truly muddy. Tromping out to 27 sites in Vietnam and southern Australia, they whacked metal poles into the ground and fixed them to bedrock. From the late 1990s onwards, and for up to 16.5 years, they trudged back through the mud to gauge changes in soil levels. “You measure these things with a ruler,” says Lovelock. They found that the muddier the water, the faster mangrove soils build up vertically: no great surprise. The problem, says Lovelock, is that 69 percent of the sites studied receive insufficient mud to uplift soils fast enough to outpace sea level rise. Unless the soil is continuously replenished, mangrove roots spend too much time submerged in the water. There, they become oxygen-deprived and eventually die. “We then asked, does this really matter?” says Lovelock. The team wanted to know how long it would be before the mangrove forests they studied completely drowned. Their data suggest that across the Indo-Pacific large mangrove areas will be lost to rising seas by 2070. Based on a computer model combining their data with various factors including projections of future sea level rise, they found vulnerable sites with low sediment supplies in Indonesia, the Philippines, Sri Lanka, and the Solomon Islands. 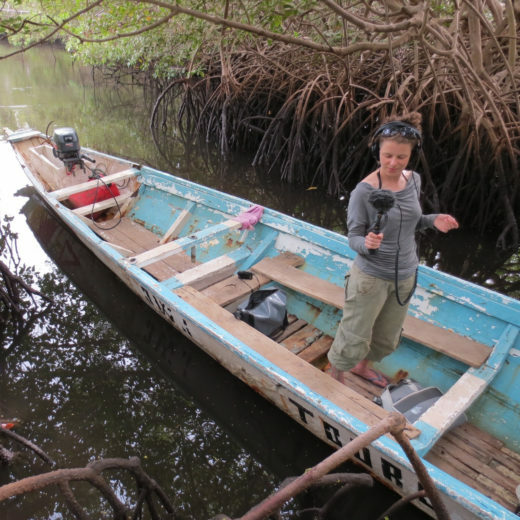 Emily Pidgeon, with the nonprofit Conservation International, knows well how important mangroves are to many people. She works with a community in an Indonesian province, West Papua, which she says “bases its entire livelihood, economy, and much of its culture around mangroves.” People eat and sell mangrove crabs, and build homes from mangrove wood. The loss of these trees would upend an entire way of life. Mud-starved mangroves, however, are not just threatened by rising sea levels. A complex mix of anthropogenic forces is already affecting some mangrove forests. At the mouth of Thailand’s Chao Phraya River, dams have reduced sediment outflow by 80 percent; groundwater extraction is causing subsidence; and human developments are blocking the way for mangroves to naturally shift inland. The result is the loss of mangroves along kilometers of coast. The problem is complex and extends far beyond the mangroves themselves. Cite this Article: Helen Scales “Mangrove Forests Are Being Starved of Mud,” Hakai Magazine, Nov 12, 2015, accessed April 21st, 2019, https://www.hakaimagazine.com/news/mangrove-forests-are-being-starved-mud/.